Coach Roesel, when did your team start dancing on the sidelines? I would say it’s been a solid six or seven years. It started with a group of kids on the bench wanting to be looser and dance during the timeouts and in between games. Then it just exploded into this thing. Is it ever a distraction? It’s just worked. This is such an emotional sport and such a game of momentum. And I’ve said it a lot: We’re just trying to keep the ball off the floor. It’s not like we’re trying to cure cancer. This is volleyball at the end of the day. Before the final set of the championship match against Wittenberg University, I’m told that you did not talk volleyball with the team. And that they put on a locker-room dance party? Was that a conscious decision, or just spur-of-the-moment? There’s a story behind it. You probably don’t know about the 10-minute break between the second and third sets. It’s interesting. It’s kind of a halftime break, and it’s standard in NCAA Division I. But it’s strange for us in Division III, because it doesn’t happen in regionals or the playoffs or during the season. I don’t really know why they do that just during the national championship. Anyway, it’s also a rule change. At the national championship in 2013, I found out about the 10-minute break right before the match. That year, we played Calvin College in the final. We hammered them in the first two sets before the break, and then … it was the longest 10 minutes. I think the break gave the kids a lot of time to think about the enormity of the situation. Then it started getting tense out there and Calvin got all the momentum and we ended up losing. And you didn’t want the same result this time. had lost the same exact way the year before. They had won the first two sets and then lost the last three for the championship. That was the best decision I ever made in my professional life, to reach out to her. What a difference it’s made in my life. We’ve become really, really good friends. I absolutely adore her. She shared with me that in that 10-minute break in 2013, all they did was mess around in the locker room. They played some game and just kept it really light. She thought, “If we hammer them with volleyball stuff right now, we’re going to lose. We’re not going to have any chance.” She really beat me at my own game. So this time, we were up 2-0 again at the break, and I’m sure some of those returning kids had it in the back of their minds. Better bring out the speakers and the flashing lights. I mean, we killed them in that third set. I don’t know. Had we not done that, would we still have won? Had we danced in 2013, would we have won? Did the time go by quickly? No, the 10 minutes was an eternity. Whether you’re losing or winning, you just kind of want to get out there and get it going. So it still felt like a long time for me. But I had to drag the kids out of the locker room because they were just having so much fun. 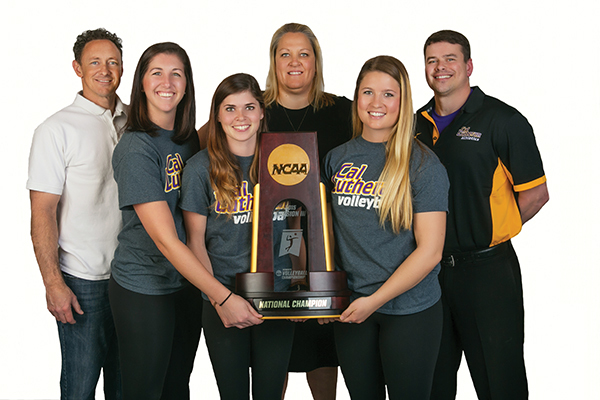 Regals volleyball claimed the NCAA national title in November.